Our only pool table to offer dual heights, rise to play pool then lower to dine. Come and experience the Aramith Fusion in our showroom. Available on finance, subject to acceptance. Home Leisure Direct is proud to have been selected by Aramith to be one of their exclusive partners. We have joined a very select few retailers who are able to supply this stunning piece of design globally. Aramith Fusion Pool Tables are beautifully crafted tables with a range of innovative features, sleek European style, patent-pending pocket design and the amazingly simple Easy-Lift System. "Times are changing, things get blurred, and “fusion” has become more than just a concept: we have fusion of generations, fusion of cultures, fusion cuisine, fusion music. Now we finally have the Fusion table. "For years, dining tables have been an object of design. They come in all shapes, materials and styles but they all remain basically mono-functional serving as a dining table only. "People, however, have changed dramatically. Well designed products are still a must, but people increasingly look for emotional value. They don’t just buy nice products: they look for good times, passion, emotions, moments to remember. That’s why in this computer age, the new trend of lounging and cocooning at home, sharing memorable moments with your family or friends in a relaxed way and in the comfort and cosiness of one’s home, has become important to balance our lives. "When it comes to family home entertainment, the Fusion table has everything needed to create those unique memorable moments to share. Convertible in just seconds, the Fusion table transforms a design dining table in a high quality billiard or game table. Created by Aramith, long-time leading manufacturer in the billiard industry. "The Fusion pool dining table innovates by adding multi-functionality as it combines a dining table, a pool table and a game table all in one. As such Fusion pool dining tables add new and exciting dimensions to entertainment and the dining room. "Today, a good product is not just about great design; it’s about life, it’s about people and it needs to address their need for good times and precious moments. Bringing emotional value and quality time is the key characteristic of the Fusion tables. Built with “Know-How” to entertain, the Fusion tables have indeed exactly what it takes to surprise and create those unique, exciting and memorable moments for you, your family and guests." The Aramith Fusion is available with a range of matching furniture, including matching benches, stools and chairs, and the eye-catching and modern sideboard, which provides a great storage system as well as a place to safely store the table top when you're playing a game on your new table. Your Aramith Fusion pool table comes with a great range of free accessories, with the fantastic Aramith Standard Kit containing everything you need to get started with your new table, including the Aramith Crown Standard ball set. If you want the very best, you can upgrade to the Premium Kit or even the Pro-Cup Kit, for the ultimate accessory set and some of the highest quality pool balls in the world. At Home Leisure Direct we supply your Aramith Fusion table with free delivery and installation to most locations within mainland UK. The table will be professionally handled by one of our fully insured specialist two man delivery teams. It will be placed in a ground floor room of your choice, and all packaging removed. This ensures you have the best service from Aramith and Home Leisure Direct from the moment you order, to the start of your first game. 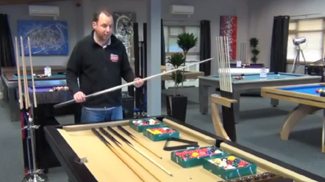 If you are looking for some expert advice, either on Aramith Fusion Pool Tables or on any of our other products, please just give our friendly team of advisors a call on either our freephone number 0800 622 6464, or on our main line number 01454 413636.